Head coach Rassie Erasmus has named 13 of his South Africa tourists into the Barbarians group preparing to face Argentina on Saturday. They include World Rugby Breakthrough Player of the Year Aphiwe Dyanti and Player of the Year nominee Malcolm Marx. 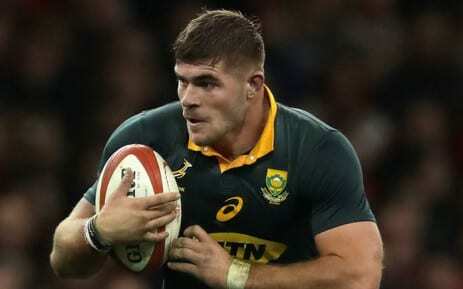 The rest of the Springboks contingent is backs Damian de Allende, Elton Jantjies, Jesse Kriel and Handre Pollard, and forwards Schalk Brits, Lood de Jager, Pieter-Steph du Toit, Steven Kitshoff, Siya Kolisi, Malcolm Marx, Trevor Nayakane and Skihumbuzo Notshe. There are players from seven other nations in the invitation side’s cosmopolitan squad for the Killik Cup match at Twickenham on December 1. Tickets to the Killik Cup match between the Barbarians and Argentina on December 1 start at £20. Go to www.ticketmaster.co.uk/barbarians for details. Scrum-half Frank Lomani joins the club after playing a key role in Fiji’s historic 21-14 win against France. Argentina legend Juan Miguel Leguizamon lines up against the Pumas four years on from leading the Barbarians to victory over England. New Zealand’s Wyatt Crockett joins the squad at the end of his distinguished Crusaders and All Blacks career. And there are two players capped by Australia in Bordeaux-Begles lock Luke Jones and Melbourne Rebels wing Tom English. In keeping with the Barbarians’ traditions there are two uncapped players in the Chiefs’ Australian fly half Jack Debreczeni and the Crusaders flanker Jordan Taufua.